Carbon nanomaterials have a unique place in Nanoscience owing to their exceptional electrical, thermal, chemical and mechanical properties and have found application in areas as diverse as composite materials, energy storage and conversion, sensors, drug delivery, field emission devices and nano-scale electronic components. Conjugated carbon nanomaterial covers the areas of carbon nanotubes, fullerenes and graphene. Graphene is the newest of the carbon nanomaterials and promises to be a very active field. Already since its isolation in 2004 it has grabbed the attention of the chemistry, materials and physics communities. It promises to rival carbon nanotubes in terms of properties and potential applications with the number of publications rising from ca. 130 in 2005 to ca. 2,800 in 2010. 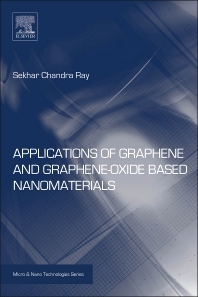 In this short book Sekhar Ray gives an overview on graphene and graphene-oxide with a strong focus on applications. Structured in three chapters, one on graphene, one on graphene-oxide and one on graphene based nanoparticles his resource describes in each chapter the preparation (including synthesis and functionalization) and material properties before detailing a whole range of applications. Ray finishes each chapter with information on remaining challenges and perspectives.